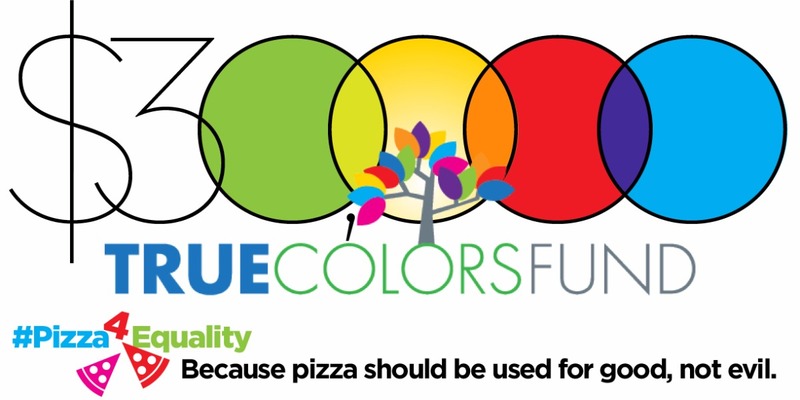 Help Homeless LGBT Youth with #Pizza4Equality! I say, yes, we can. So I looked and saw that Cyndi Lauper’s True Colors Fund has set April 29 as the first national #40toNoneDay to end #LGBT youth homelessness! And I thought, would it not be totally awesome if we equality supporters (and pizza lovers) could match that #MemoriesPizza “charity” by April 29? Can we match their amount and help homeless youth get off the street, learn life skills and get an education and jobs? I’m an dreamer, but I say yes, we can! All proceeds will go to The True Colors Fund which works to end homelessness among lesbian, gay, bisexual, and transgender youth, creating a world in which young people can be their true selves. Be sure to check out the fundraising campaign here. Tags: featured, LGBT youth. Bookmark the permalink. Previous post ← Happy Easter!